According to FactSet, S&P 500 earnings are expected to fall 4.3 per cent for the first quarter. 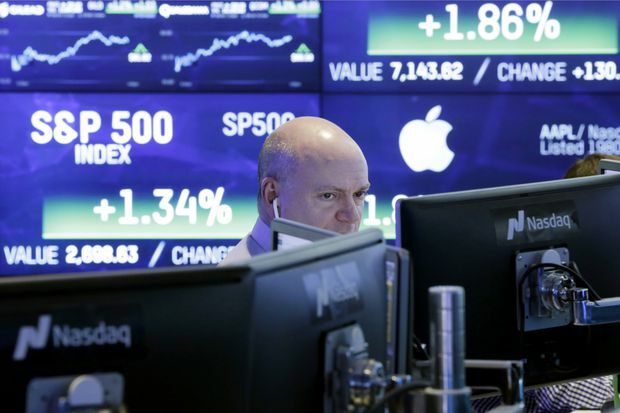 North American stocks are once again within spitting distance of record levels, and this week’s batch of corporate earnings and economic reports could play a key role in determining whether indexes can claim new highs. S&P 500 companies have posted 10 consecutive quarters of year-over-year earnings growth, a stretch that dates back to the first quarter of 2016 and has given legs to the decade-long bull market. But earnings could be headed for a rare stumble as trade turmoil, rising labour costs and a strong U.S. dollar threaten to end that streak. This week, 49 S&P 500 companies – including six members of the Dow Jones industrial average – are scheduled to release results. They include Citigroup Inc. and Goldman Sachs Group Inc. on Monday, Bank of America Corp., Johnson & Johnson, International Business Machines Corp. and Netflix Inc. on Tuesday and Morgan Stanley on Wednesday. It wouldn’t take much to send indexes over the top. As of last Friday’s close, the S&P 500 was about 23 points, or less than 1 per cent, short of its record closing high of 2,930.75 reached on Sept. 20, 2018. In Canada, the benchmark S&P/TSX composite would need to gain about 87 points, or roughly half a per cent, to eclipse its record close of 16,567.42 on July 12 of last year. Even as the broad outlook for earnings has turned negative, some companies are still issuing upbeat results. Last Friday, for instance, stocks got a lift from JPMorgan Chase & Co.’s better-than-expected results and optimistic comments from chief executive officer Jamie Dimon. “If you look at the American economy, the consumer is in good shape, balance sheets are in good shape, people are going back to the work force, companies have plenty of capital,” Mr. Dimon said on the bank’s conference call. Economic data could also figure prominently on both sides of the border this week. After a recent soft patch, U.S. retail sales – on tap Thursday – are expected to post a rebound of 0.8 per cent in March from February. “Consumer spending was whipsawed at the turn of the year by snowstorms, equity market gyrations, the federal shutdown and lower tax refunds,” BMO Capital Markets economists Michael Gregory and Sal Guatieri said in a note. CIBC Capital Markets sees an even stronger 1-per-cent gain in March U.S. retail sales, helped by the U.S. Federal Reserve’s dovish tone. “A healthy labour market and tame inflation will support real consumer spending ahead, especially with the Fed now poised to remain on hold for 2019,” Canadian Imperial Bank of Commerce economist Katherine Judge said in a note. In Canada, retail sales for February are scheduled for release on Thursday. After falling in five of the previous six months, retail sales likely continued to struggle in February. “We’re calling for flat sales overall, as the weather was pretty brutal in the month, potentially keeping some shoppers cooped up at home,” said Benjamin Reitzes, Bank of Montreal’s Canadian rates and macro strategist. The Bank of Canada’s spring Business Outlook Survey, on tap Monday morning, will provide a broader snapshot of the economy. The survey “is expected to show an economy in decent shape, though hardly anything to get excited about. While financial markets have perked up since the rough turn of the year, the domestic economic backdrop remains challenging amid high household debt, trade uncertainty and pending political uncertainty,” Mr. Reitzes said.